2019 Enrollment Agreement (PDF) – Every participant must have a signed Camp Enrollment Agreement on file. Please be sure to read the agreement carefully and review with your child. Code of Conduct (PDF) – Please review the Camp Clarita Program Participant Code of Conduct as referenced in the Enrollment Agreement. Please initial the space on the Enrollment Agreement to indicate your understanding of the Code of Conduct. Medication Consent Form (PDF) – If your child will need to take medication while at camp, please complete the Medication Consent Form and bring it with you on your child’s first day of camp. 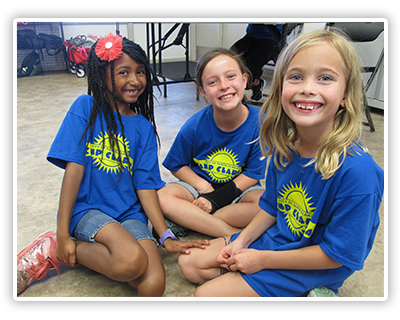 Campers enrolled in Wee Folks, Little Folks, Ranger Camp and Explorer Camp are required to wear a camp T-shirt daily. NO EXCEPTIONS. Voyager Campers do not wear camp T-shirts. One T-shirt, regardless of the number of weeks enrolled, will be provided for each participant on their first day of camp. T-shirt sizes are as follows: Youth Extra Small (size 2-4), Youth Small (size 6-8), Youth Medium (size 10-12), Youth Large (size 14-16), Adult Small, Adult Medium and Adult Large. Additional T-shirts may be purchased for $8 each online and picked up at the camp location once the program begins. You must show a copy of your original receipt when picking up T-shirts purchased online. Camp T-shirts will also be available for purchase at the park location once camp begins with a check. If your child arrives at camp without a Camp Clarita T-shirt, one will be provided to him/her for a fee of $8.00. Payment, payable by check, will be due upon picking up your child. We do not have loaner shirts available. Informational meetings to discuss camp policies will be held on the dates listed below. These meetings are for parents only and children should not attend. Wee Folks and Little Folks Camp Camp – Tuesday, June 11, 2019 at 6:00 p.m.
Voyager Camp – Tuesday, June 11, 2019 at 6:00 p.m.
Ranger and Explorer Camp (NOP, SCP, & VMP) – Wednesday, June 12, 2019 at 6:00 p.m.
© City of Santa Clarita Recreation and Community Services Division.